Gypsum, a hydrated form of calcium sulphate, occurs in Egypt in either rock or crystal form and was made into a thick plaster. It was applied to the surface of poor-quality timbers to disguise the grain and any exposed defects. If paint was to be used to decorate a piece of furniture, then a thinner ground made from whiting and gum or glue would have been laid on to the timber. This material is called gesso and made a perfect foundation for paint. The paints were made by finely grinding naturally occurring minerals and mixing the powder with water and an adhesive such as size. Gilding was another technique applied to timber and was achieved by laying very thin gold leaf upon a wet film of gesso. This latter dried and acted as an adhesive holding the gold leaf firmly to the wooden core. Thicker gold foil, and sometimes silver, a metal not occurring naturally in Egypt, were pressed and punched on to the wooden core and held in position by small nails. 14. 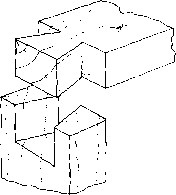 Mortise and tenon joint. turning the log against a long knife. Ebony was extensively used as a veneer and was fixed into position with gum or glue and held with small dowels to prevent it from slipping or twisting while the adhesive set. Both ebony and ivory were used in sheet and strip form for inlaying into better-quality timbers. Other materials such as faience, which is a green or blue glazed non-clay ceramic (of crushed quartz, lime and natron), and polished stone, such as carnelian, were also inlaid into wooden furniture. The ability of the carpenter to apply complex decoration is best seen with the techniques of marquetry and parquetry. Two boxes discovered in the tomb of Tutankhamun (Eighteenth Dynasty) have their panels decorated with thousands of tiny pieces of wood carefully arranged and glued into position in a herringbone pattern. 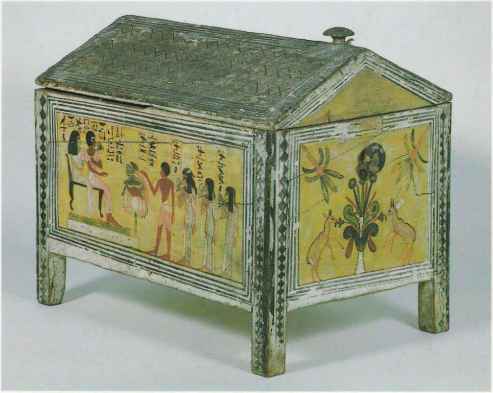 Clear varnish, made from resin mixed with oil, was used to protect timber during the Eighteenth Dynasty. Black varnish, made from pitch and oil, was also painted on wood to seal the grain. To cover and protect paintings, beeswax was often applied but it is uncertain whether it was used as a polish on timber, although it is the base from which many modern polishes are manufactured.